Partially harden DEF of your Tactics. Partially strengthen ATK of your Tactics. 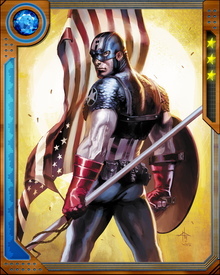 Trapped in suspended animation for decades, Captain America has been revived to continue his crusade for the American Dream. 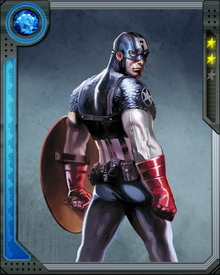 With an indestructible shield that can be used to deflect attacks or hurled as an offensive weapon, he valiantly fights the enemies of freedom.